Are you troubled with a small screen bike computer? 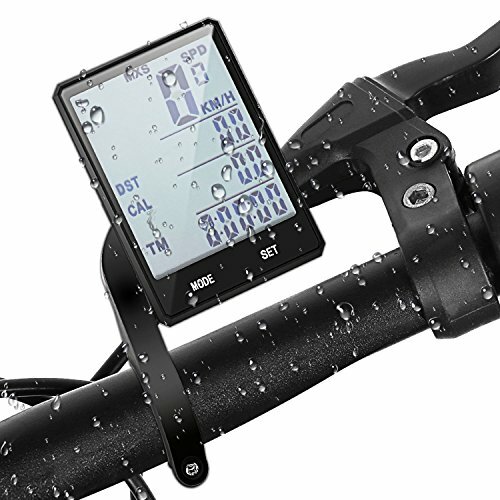 That's exactly why we recommend you this 2.8 inch large screen Wireless bike Odometer, IPX6 weather-resistant, easy to read with big number and white backlit. 1. Bike computer and sensor contains CR2032 button cell battery. 2. About setting wheel, to measure the height of your tire in inches, multiply by 3.14, and then convert to mm. this will be what you enter for Wheel I and Wheel II. 3. Installing distance requires no more than 60cm or 23.62 inch from computer to sensor, so sensor must be installed onto the front fork of bicycle. 4. Magnet has to be very close to the sensor, the gap between the front fork and spoke is less than 2.2 inch, so not suitable for large sized fork, like recumbent bike, spinning bike, 26 inch Schwinn cruiser bike with coaster brake, fat bike 4 inch rim. 5. Mount suitable for most bicycles 25-31.5mm diameter handlebar, you also could built up layers of rubber so it held on tight to the handle bar. If you have any questions about this product by Cycloving, contact us by completing and submitting the form below. If you are looking for a specif part number, please include it with your message.